Photo sent in by Isabel Penny (that's not her in the car). 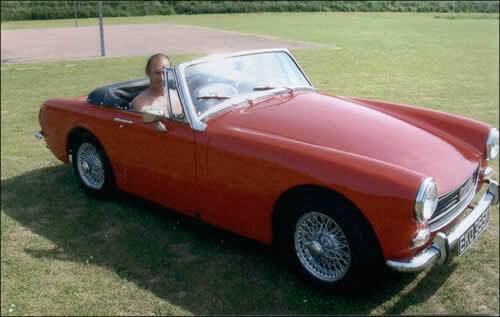 The car is an MG Midget - round wheel arch, made in 1972 which means that it is tax exempt, the colour is Tartan Red. The car took approx 18 months to restore, this was evenings, weekends and days off time. the car had some welding done before a respray. The midget is really enjoyable to drive, especially in the summer months with the hood down. A very nice restoration and the wire wheels look great. I once drove a mate's MG Midget in the old Flower Power Days, which was a very desirable car in the 70's. Before Isabel bought this car, it was owned by an old friend of mine, Harold Burniston. I know he won't mind me saying this as he died about 5 years ago! We were having lunch at a pub near Newmarket and I spotted it in the car park. It had ivy growing all over it and had a wooden pallet propped up against the door. I said the Harold 'What a shame. That is a real classic'. As we came out from the meal he said, 'I have bought it! It will be delivered tomorrow'. I said, 'But you haven't even looked inside'. In fact, the body work was very good, having had a number of new panels but it had no floor.